If you are looking for a small dog with a whole lot of personality, look no farther. The Toy Foxy Rat Terrier is a hybrid of the Toy Fox Terrier and the American Rat Terrier. This means that he is a small bundle of affection and playful excitement, combined with an inherent love for adventure. While the Toy Foxy Rat Terrier is rather small, he is sturdy and always ready for anything. While not very vocal, he will let you know his thoughts when he thinks they need to be heard. He is not about to let his size slow him down! With big ears, lovely eyes, and a fine coat, you may find it hard to ignore or walk away from this little charmer if you were to come across it on the street. Toy Foxy Rat Terriers are not recommended for families with toddlers. What Price are Toy Foxy Rat Terrier Puppies? The price of Toy Foxy Rat Terrier puppies $350 to $900. How to Find Reputable Toy Foxy Rat Terrier Breeders? It’s important to support reputable breeders and avoid funding places that exploit dogs. In your quest to find a reputable dog breeder, there are telltale signs to watch out for. A reputable dog breeder is concerned with the betterment of a breed. Their breeding seasons are meticulously planned. A reputable breeder focuses his efforts on the health and growth of his dogs. They sell their puppies at high prices to cover their costs and to screen buyers to ensure they can afford appropriate care for their new puppy. Attend dog shows. Well-bred dogs are featured in dog shows, so they’re a great place to get referrals to quality breeders. Ask for references. A good breeder will have plenty of great references and they won’t mind providing them to you. Ask your veterinarian for referrals. They see a lot of dogs in their practice and they are familiar with their veterinary history. Organizations like local hunting dog groups, gun dog associations, retriever clubs, and others will be aware of local legitimate breeders known for producing healthy dogs. If you have friends who are familiar with particular breeds or who have a healthy dog of the breed you are looking for, ask them for a referral to their breeder. A reputable breeder will be ranked in search engines as well. Google around and use the tips on how to identify a reputable dog breeder. The Rat Terrier parent originated in the United States and was used primarily as a farm dog to catch rats. The Toy Fox Terrier parent is another American dog that started out as a farm hand and whose main purpose was to catch and kill small vermin in the property. 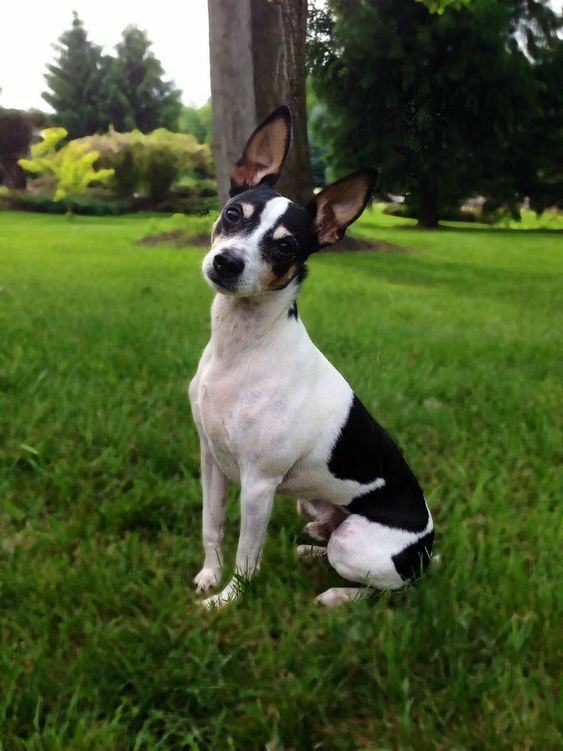 With such a background, the Toy Foxy Rat Terrier is a proud and very active breed who loves to play and work all day. Toy Foxy Rat Terriers are stubborn, independent, and fearless. The Toy Foxy Rat Terrier is going to look very similar to the Rat Terrier and the Toy Fox Terrier. This is because the parent breeds already resemble each other greatly in coloring and facial features. The greatest difference is going to be size. 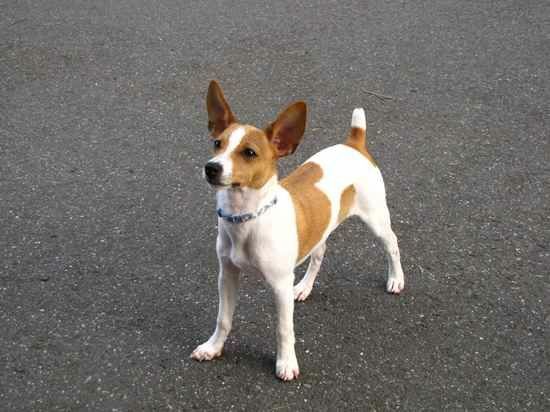 The Toy Fox Terrier is a toy breed while the Rat Terrier is a small to medium sized breed. Because of this, the Toy Fox Rat Terrier will vary greatly in size, even within the same litter. His coloring is available in a broad spectrum. The fur is short and smooth, lying close to the body. Because of this shorter fur, the Toy Foxy Rat Terrier prefers warmer climates. To round off his appearance, the Toy Foxy Rat Terrier has very tall and erect ears, round eyes, and an elegant muzzle. Their coat is very low maintenance but does tend to shed often. This means that regular grooming may be needed if you do not want to have your house filled with dog fur. Brushing with a slicker brush at least twice a week is a great way to keep your dog’s fur clean and healthy. Doing so will also keep shedding at a manageable level. Give your Toy Foxy Rat Terrier a good bath every other month or so. You might have to give one sooner if he gets into some form of messy mischief! Aside from brushing and bathing, you need to keep your dog’s ears clean and nails trimmed. How Big is a Full-Grown Toy Foxy Rat Terrier? The Toy Foxy Rat Terrier can grow to 11 to 19 inches in height and weigh 10 to 25 lbs. What is the Life Expectancy of the Toy Foxy Rat Terrier? The life expectancy of the Toy Foxy Rat Terrier is 12 to 15 years. The Toy Foxy Rat Terrier is the mix of the Toy Fox Terrier and the American Rat Terrier. If you are thinking about getting a Toy Foxy Rat Terrier, be prepared for a lot of energy. Thanks to his parent breeds and the Terrier’s natural instinct, the Toy Foxy Rat Terrier is going to want to go, go, and go! He loves to play. For the outdoor enthusiast, he is the perfect travel-sized companion for camping and hiking adventures. Not very talkative and great with kids, the only downside to the Toy Foxy Rat Terrier is that he may be a bit touchy around other dogs. Thankfully, he is a dog that is eager to please. With early socialization and regular training, this issue won’t stick around for long. The Toy Foxy Rat Terrier is a great dog for any level of dog owner, from beginner to advanced. He is a sweet and affectionate dog is also courageous and ready for anything. He is perfect for those who want a companion that will stay by their side through thick and thin. All breeds have specific diets. The Toy Foxy Rat Terrier is a breed that can thrive on red meat and fresh fruits. Ideally, all dogs should have freshly made food every day. However, many Toy Foxy Rat Terrier owners find it easier to buy a bag of commercial dog food instead. Ask your vet how often and how much you should feed your dog. Ask him what foods are allowed into his diet. Depending upon your dog’s health needs, some vets recommend feeding the with two small portions twice a day. Some vets recommend a healthy platter once a day. The size of an eating platter or serving portion depends on the size of your dog. Also, some working dogs or active dogs consume more calories a day and will, therefore, need more food. Meat is an essential element to your Toy Foxy Rat Terrier’s diet. Chicken, beef, pork, and venison are all acceptable sources of meat protein. Fruits and vegetables are also great sources of additional nutrition. Lastly, give your dog lots of drinking water. Do not limit their water intake to just a cup or two a day. How Much Exercise Does a Toy Foxy Rat Terrier Need? The Toy Foxy Rat Terrier may be small, but he has enough energy for every single dog at the dog park. In order to keep this breed happy and out of trouble, a minimum of three hours activity time is suggested. While playing around in the yard will be a great way to bond and burn a bit of energy, a lot more exercise than that is going to be needed to wear this exuberant character out! A long walk a couple of times a day, jogging, hiking, and training are some great ways to burn that energy in a productive way. Be sure to spend a decent amount of time training so it will be a pleasant experience for both you and your dog. Doing outdoor activities together each day will create a lifelong bond and make a very happy dog. Major health concerns for this breed include lens luxation, Legg-Calve-Perthes Disease, Von Willebrand’s Disease, hip dysplasia, elbow dysplasia, and patellar luxation. Minor health concerns include dental problems, color dilution alopecia, hypothyroidism, epilepsy, allergies, and demodectic mange. There may be occasional diagnoses for heart problems and deafness. Your veterinarian may also request occasional tests like knee x-ray, heart testing, hip and elbow x-rays, full physical examination, skin evaluation, and dental examination. Toy Foxy Rat Terriers are stubborn, independent, and fearless. They should not be trusted around cats or rodents. When outdoors, unless you live on a farm, they should always be on a leash or in a fenced yard. Their desire to chase is strong, and they will take off with no regard to your commands to return home. Even a well-trained Toy Foxy Rat Terrier will ignore you when he’s giving chase. Fences should be high and stuck deep in the ground. They are excellent jumpers, and if left alone, they will dig under fences in a matter of minutes. Toy Foxy Rat Terriers are not recommended for families with toddlers. They will not like being poked, tugged, or pulled. 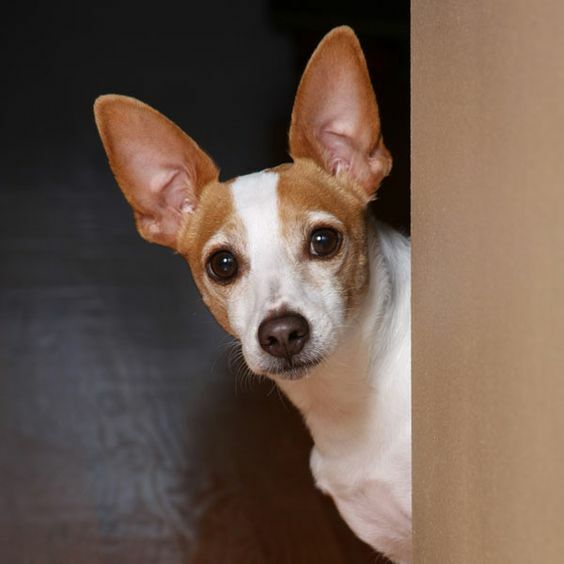 Small children do not understand a dog’s boundaries and limitations, and the Toy Foxy Rat Terrier’s response to children will be to snap or bite.